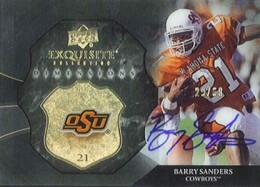 "The Upper Deck Company will trade you this card for an Upper Deck Football card of a 1st Round Quarterback Draft Pick. Redeemed cards will be mailed beginning June 1, 2013." 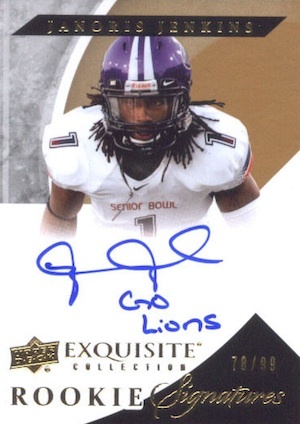 "The Upper Deck Company will trade you this card for an Exquisite Rookie Signature card of a 1st Round Quarterback Draft Pick. Redeemed cards will be mailed beginning December 1, 2013." AP-AC Anthony Carter "Lets Go Blue"
AP-AG Archie Griffin "The Ohio State University"
AP-AJ Alshon Jeffery "Go Gamecocks"
AP-BB Brian Bosworth "Boomer Sooner"
AP-DL Daryle Lamonica "Play Like a Champion Today"
AP-DP DeVier Posey "Go Buckeyes"
AP-GB Gary Beban "Go Bruins"
AP-JB Justin Blackmon "Go Cowboys"
AP-JK Jim Kelly "Go Hurricanes"
AP-JN Joe Namath "Roll Tide"
AP-JT Joe Theismann "Go Irish"
AP-MF Michael Floyd "Fighting Irish"
AP-RG Robert Griffin III "BU Bears"
AP-RT Ryan Tannehill "Gig 'Em"
AP-SB Bart Starr "Roll Tide"
AP-SY Steve Young "Go Cougars"
AP-TR Trent Richardson "Roll Tide"
AP-VT Vinny Testaverde "Go Hurricanes"
2012 Upper Deck Exquisite Football is part young stars, part veterans, part retired legends and all high-end. The brand that introduced ultra high-end to the hobby returns with five autographs in every six-card box. 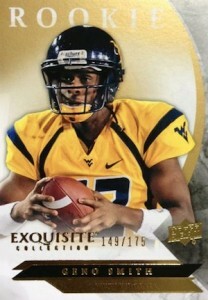 As always, everything in 2012 Upper Deck Exquisite Football is extremely limited and made with premium quality. Rookie Auto Patch cards fall one per box. Focusing on the loaded 2012 rookie crop, each has an on-card signature and a compelling patch from a player-worn college jersey. There are 30 cards in the set. An extremely limited number of trade cards are good for a complete set of Rookie Auto Patch cards. 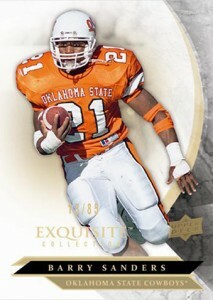 Every 2012 Upper Deck Exquisite Football box also promises either an UD Black or UD Black Rookie Lustrous card. These cards use a dark card stock with a gold autograph. Rookies also have a patch swatch. 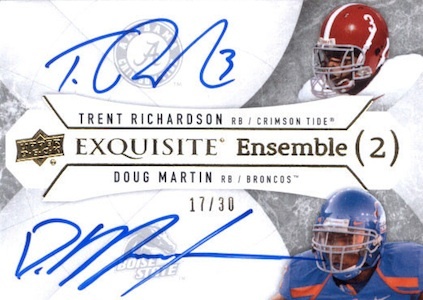 2012 Upper Deck Exquisite Football has several other autograph inserts, including inscribed Alumni Pride, Exquisite Dimensions, Legacy Signatures, Exquisite Art and Exquisite Book Marks. 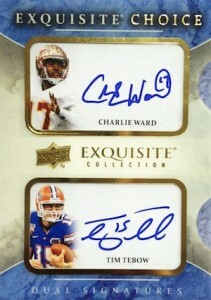 Multiple autographs can be found on Exquisite Sixteen, Exquisite Choice Duals and Exquisite Choice Quads. Every three-box case has signatures from at least two of the following players: Robert Griffin III, John Elway, Aaron Rodgers, Jerry Rice, Barry Sanders, Dan Marino, Joe Namath, Russell Wilson, Ryan Tannehill and Trent Richardson. 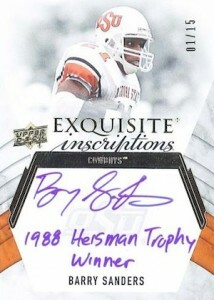 Not sure here – why is the release date the same as the UD SPX football ? michael � They’re not. Until literally 30 minutes ago, all we had for Exquisite was a June release date (6/13) — just got word it’s June 25. SPx is June 13 (6/13/13). Ryan — does this set have any players from the 2013 draft in it ? I also wonder why Peyton Manning is never or rarely in any UD products but Archie is. michael � Haven’t seen a final checklist so can’t say for certain, though I suspect it’ll focus on the 2012 rookies. Do you know if Upper Deck has confirmed whether Andrew Luck is in this product or not? I have heard yes and no and am apprehensive to buy it pre-sell without knowing. Your help is much appreciated. Chris � UD has never stated Andrew Luck is in any of its products. Until they do, it would all be speculation. confused……So this is 2012 but the rookies are teh 2013 class. So I won’t pull an rg3 rookie out of this? Erik � The Rookie Signature Patch cards have 2012 draft players. The 2013 Rookies appear to be a separate subset that aren’t autographed. this product is a ‘3’ without luck and a 5+ with him – how could UD even call this the 2012 class without luck?? i see the guarantee of 2 of these guys autos in each case but the ace of the deck is somehow missing? I rate this 4.0 stars, with luck in it 5.0 stars. Quick question. I pulled the redemption but it just says hand numbered on the checklist. Jeff Ramos � Not sure if they’re autographed or not. If we find out, we’ll be sure to post the info. 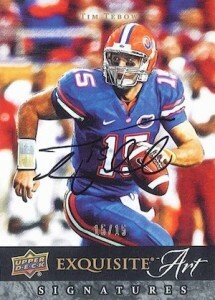 To all of whom are concerned regarding in the 2012 Upper Deck Exquisite box breaks, Andrew Luck has just signed with Upper Deck effective 7/9/13! 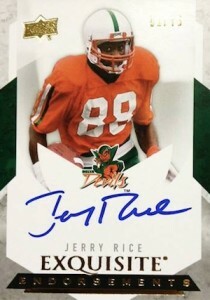 I’m sure that this last rookie card will be highly sought after and carry a huge premium in the secondary market. I received this information via “Steel City Sports Cards”! I forgot to add that the card will be a “Rookie Signature” card with a print run of #/99.